My mother in law is the queen of gift giving. No one can top her when it comes to finding the perfect gift, combination of gifts or making the gift giving season last and last. Christmas is her favorite! She gives Kira presents for every Sunday in Advent. And I’m talking about a big gift bag/box of perfectly coordinated items, usually a book, toy, outfit, game/puzzle and always an ornament for the tree. It’s amazing and overwhelming all at the same time. Kira loves it and basically sits by the door every Sunday morning for the entire month of December. She also go all the way for Valentine’s Day, St. Patrick’s Day, Easter, Birthday (in May), 4th of July…see where this is going. The entire family agreed 2 years ago that since we are family there is no need for thank you notes. Now up to that point, we had all been super diligent about sending them to each other. So last year no notes and the truth is it felt totally wrong. So this year I thought of a great alternative. 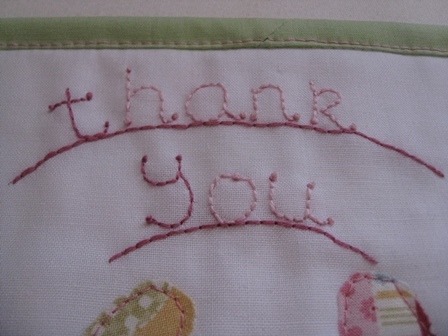 The new Thank You note…..
A thank you mug rug!! No one is as dedicated to their morning coffee as she is, so now her coffee mug has a place to rest. She is reminded of her grandchild and gratitude has been expressed. A bit more time-consuming than a simple card/note but how happy am I to have yet another reason to quilt. Now I don’t think I’ll be making one for every holiday but definitely for the big ones!! This one is for Christmas/Easter. The next one will be saying thanks after Kira’s birthday. 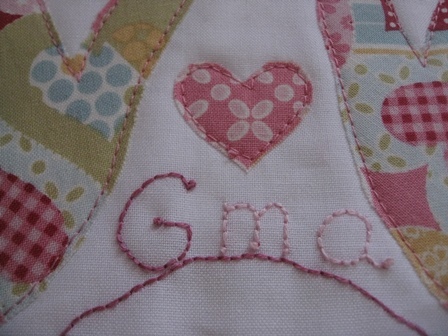 This has all my favorite elements, a bit of embroidery. I got to practice my French knots. And the actual quilting of course. 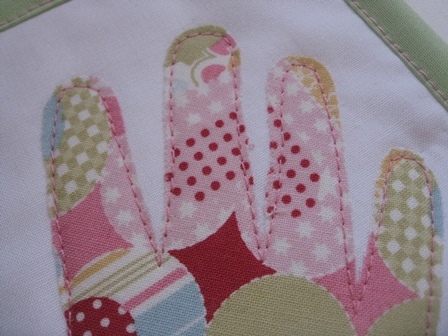 My mind has been racing with all the applique projects and applications out there. Let’s face it, my mind has been racing with tons of projects period! 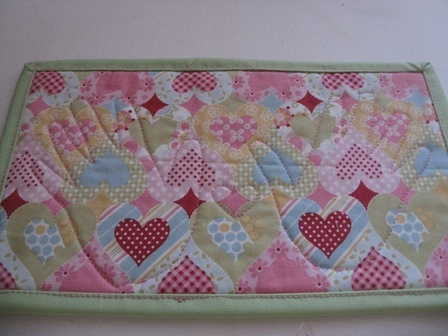 I love the back of this mug rug the most. I’ll talk about the process of arriving to this point in another post. All wrapped and ready to go. Kira delivered it to the Gma on Sunday to rave reviews!! Mission accomplished!! I might borrow it back to add a date. I always forget to add a label. 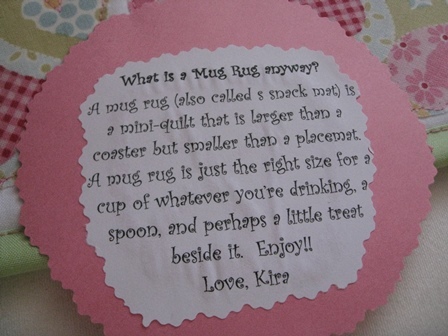 The wording for the mug rug was found on Pinterest then I added a personal touch. Now to make them for the rest of the family. Oh what a heavy burden, all these thank you notes to “write”…hee hee!!!! 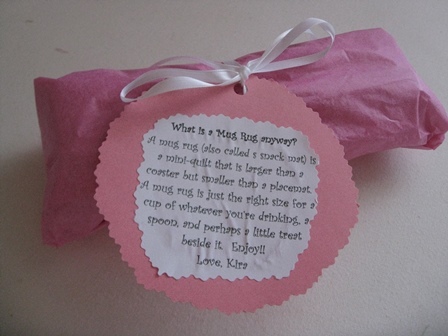 I already said this on Facebook but it bears repeating, I think this is such a cute and sweet idea! 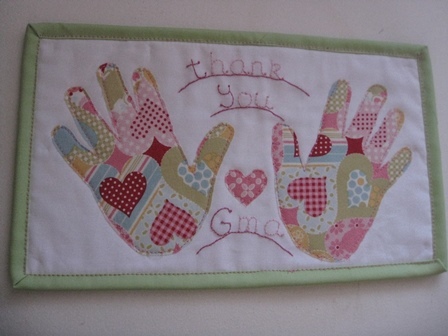 LOVE, LOVE, LOVE this idea as a thank you. Did she flip when she opened it?